Many, many Rainmeter skins use an outdated way of displaying a background behind a string meter on MouseOver to convey its click-ability by changing its SolidColor option on a MouseOver and MouseLeave action. 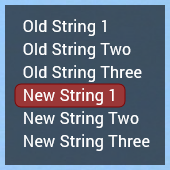 Here is a simple method to convey a string's click-ability using a dynamic shape meter. It is simple. First define what it is (Rectangle), followed by its X,Y,W,H coordinates. For this example, we do not need to define its X,Y coordinates in the Shape option, and can leave them as 0,0. The last number (6) is how rounded the rectangle's corners should be (0 for fully square). Next we have its self-explanatory Fill Color, Stroke Width, and Stroke Color. Tip: #HighlightW# and #HighlightH# do not need to be defined in the Variables section. Rainmeter will create them automatically when necessary, keeping your code cleaner. This MouseOver and MouseLeave action display the hidden shape, then sets its X, Y, W, and H coordinates to be identical to #CURRENTSECTION#'s, then hides itself when the mouse leaves the string's location. This can be used for all meters, including images. Using the Padding option on meters will give a bit of wiggle-room for your meters to fit nicely inside of the shape. Last edited by Virginityrocks on April 6th, 2018, 2:54 pm, edited 3 times in total. This is an interesting approach, I can learn from this and implement it in my future skins. My technique is to hide my shape, outside the skin's visible area, then set the specific Y position on a mouseover.